Erotica, or shunga (i.e., spring pictures - 春画), were a type of print that were neither signed nor approved by the censors. They were officially frowned upon although millions of impressions were produced. The curatorial notes from the British Museum say: "The place may be the shallows of the Sumida River at Mitsumata, between Eitai and Shin'o Bridges, with the corner of the garden of Lord Tayasu's residence in the background." This print has been reproduced often. It appears on page 120, fig. 132, of Ukiyo-e: The Art of the Japanese Print by Frederick Harris. 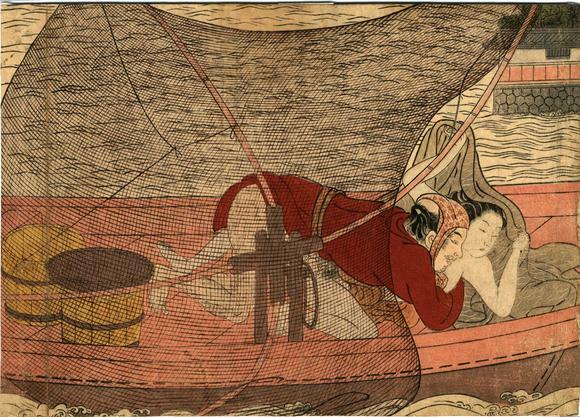 He wrote: "In this print, a fisherman takes time off from his work to enjoy a little fun with a young woman. Who could she be? Her kimono is rather plain and there are no adornments in her hair. She is not a courtesan, perhaps a young person from the docks. They are lying behind a large fishing net designed to catch very small fish, judging from the basket and relatively small wood containers. The man is hairy a feature almost never present on a samurai or nobleman. Only fishermen, carpenters and other tradesmen would be given hair on their arms and legs." Also illustrated in color in Japanese Prints: Images of the Floating World, Barry Davies Oriental Art, #10, illustrated on p. 21.